On Wednesday, Rony Colin, the Mayor of Croix-des-Bouquets accompanied by the two deputy mayors Jean Jonas Saint-Juste and Mrs. Géraldine Jean François Cetoute, his Head of Cabinet, Jacky C. Pierre, Jacques César, Director General of the Town Hall in the presence of the population, proceeded to launch the construction of the public square of Bon Repos which will be called "Plas Gwo Wòch" (Place of the big stone). It is the Haitian construction firm "Engineering and Construction Company" (Engenco) which will execute the works financed to the tune of 7 million Gourdes by the taxes of the taxpayers of the Commune. The expected duration of the work is 6 months. This square, which will be built at the intersection of the Lilavois road and the National Road #1, opposite the Bon Repos police sub-station, with an area of ​​3,655 m2 and 246.6 linear meters, will include : a multi-disciplinary playground, a kiosk for cultural and artistic activities, a green space, a water supply and electrification system. Next to the square, will be built a multimedia library. 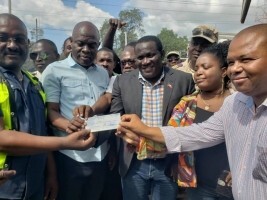 After the laying of the first building stone of the Bon Repos Square, Mayor Colin handed the managers of the company "Engenco" a check representing the first payment of the total amount for the start of work.